First model for my airport diorama.. Yay! Every time I traveled, I saw over-priced miniature aircraft in in-flight magazines. Then one day I saw pictures of a diorama airport on Instagram and then I realized why they must’ve coined the tag #aviationporn. There was a huge community building model airports. Wondering where they got their models, I checked eBay and Amazon to find that there are a few manufacturers and tons of sellers. 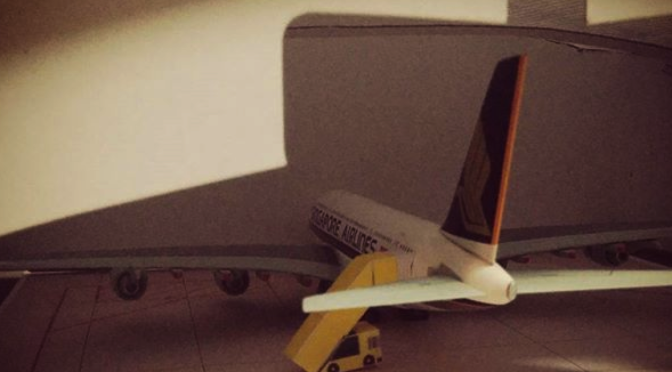 I wasted no time in ordering in my very first model – the majestic A380 that Singapore Airlines was First to Fly. The next step was to go about designing the airport itself. Downloading foils from the internet was easy. But there was other detailing that required craft-work, and I started off with chunk-sized PoCs. The very first was for the jetways. Me & my brother used to save bellowed plastic straws for this when we were kids. I got a back of straws to re-create them and what turned out wasn’t very polished. Next was the ground equipment, but I soon realized that I had to use thicker paper. I had some card paper that came with laundered clothes which I used to create a hangar – and that turned out well.